Despite an increase in the area of occupancy in several parts of Europe due to successful conservation interventions, this species is locally extinct in large parts of central Europe. The risk of losing additional habitats, especially in eastern Europe, is increasing. The situation in the near East and in Asia is not well known. The Eurasian otter has the widest distribution of all otter species. Its range covers parts of three continents: Europe, Asia and Africa. Originally the species was widespread throughout Europe. Little is known about the original distribution in Africa and Asia. It is known from a wide variety of aquatic habitats, including highland and lowland lakes, rivers, streams, marshes, swamp forests and coastal areas. Otters have been found in the brackish waters below sea level in the Netherlands, up to 1,000 m and more in the Alps or the Pyrenees, and above 3,500 m in the Himalayas or 4,120 m in Tibet. It is very adaptable, using saltwater as well as freshwater habitats, sewerage systems in urban areas or rivers in Asia. In most parts of its range otter distribution is correlated with bank side vegetation. Otters in different regions may depend upon different features of the habitat, but the important component of otter habitat, for breeding purposes, is the presence of holes in the river bank, cavities among tree roots, piles of rock, wood or debris. The Eurasian otter avoids deep water. Their distribution in coastal areas, especially the location of holts, is strongly correlated with the presence of freshwater. The aquatic habitats of otters are extremely vulnerable to man-made changes. Canalization of rivers, removal of bank side vegetation, dam construction, draining of wetlands, aquaculture activities and associated man-made impacts on aquatic systems are all unfavourable to otter populations. Pollution is major threat to the otters in western and central Europe, the main pollutants posing a danger to otters are the organochlorines dieldrin (HEOD) and DDT/DDE, polychlorinated biphenyls (PCBs) and the heavy metal mercury. Coastal populations are particularly vulnerable to oil spills. 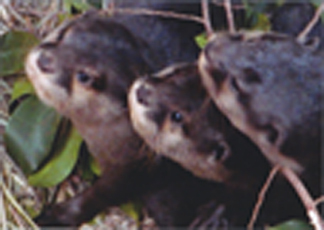 Acidification of rivers and lakes results in the decline of fish biomass and reduces the food resources of the otters. The same effects are known to result from organic pollution by nitrate fertilisers, untreated sewage, or farm slurry. In addition, major causes of mortality from several countries are drowning, road kills, and poaching. Fyke nets set for eels or for fish as well as creels set for marine crustaceans have a great attraction to otters and a high risk to those that successfully try to enter these traps. A further potential threat is strangulation by transparent, monofilament drift net. A potential risk comes from traps designed to kill other species, especially underwater cages constructed to drown muskrats. Illegal hunting is still a problem in many parts of their distribution range. In several European countries political pressure especially by fishermen has resulted in granting of licenses for killing otters.